The Five Bells And Bladebone: I've read 37%. I'm having fun with this one which is why I continue listening to the Richard Jury series. 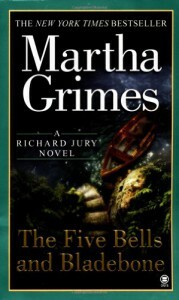 The previous two or three books did have rather abrupt endings and ambiguous, unsatisfying reveals, though, so I'm hoping the series gets back on track with Five Bells. Grimes' humor always manages to amuse me, and while she's definitely the queen of the simile, her love for them rarely bothers me.